“For many years President Arthur was represented in the Manuscript Division by a single document… Beginning in 1910 and continuing to the present, successive chiefs of the division have done what they could do to assemble surviving Arthur manuscripts. For the first of these chiefs, Gaillard Hunt, who in that year intitiated the search for the main body of Arthur Papers, there was little but discouragement as a result of his inquiries. However, his persistence and what he was able to learn were to encourage his successors. ‘I beg you will excuse my tardiness in replying to your letter of November 4th . The question of my father’s papers is a very sore subject with me. The story just keeps getting stranger. This entry was posted on December 10, 2008 at 9:39 pm and is filed under Uncategorized . You can follow any responses to this entry through the RSS 2.0 feed You can leave a response, or trackback from your own site. Considering the lengths to which Chester Arthur went, to conceal his personal history, it is more than amazing you were able to retrieve as much as you were and could put together an irrefutable history of his illegitimate Presidency. Sherlock Holmes would be more than proud!!! It’s an episode of the Twilight Zone… Obama seems to make documents vanish, also. Sorry about the fact that SC will never ever never even give any case about Barak Obama the light of day. For the try and I hope in some way you have good fortune for the attempt. Chester his the truth of his British citizenry at birth, and got away with it. Barack is not hiding the truth of his British citizenry at birth, and it appears he will get away with it. looks like someone was trying to hide the truth. was it to hide the fact that he was a usurper and it would damage the family name? This is a bit off-topic for this post, but regarding Cort’s recent supplemental brief and his application for stay and/or injunction, how do you know that the SC Clerk’s Office is presenting the documents to the Justices as-filed. Is there any means of real-time, two-way communication with the Justices to confirm that the documents that you guys filed are in fact the documents before them? Would such communication be appropriate or even allowed? I became concerned about the influence of the Clerk’s Office when I first heard of your difficulties with Danny Bickel, but it was a few comment entries by “Nick” under the “The Washington Times Coverage of the Donofrio and Wrotnowski SCOTUS Cases” posting that really worried me. I sincerely hope that Chief Justice Rehnquist’s experiences/observations as a clerk are the not the norm, but fear that they may be. I have been following your lawsuit for several weeks and now Cort’s as I have great interest in them in terms of the constitutional eligibility of the Presidential candidates and how you guys got to the SCOTUS against all odds. I certainly looks like we’ve had a fraudulent election, and you guys have done a great job of smoking it out. I love the historical information on Chester Arthur and his personal cover up. What a find! Keep the updates coming, and keep up the great work. Our country needs you guys, a good history lesson, and a wake up call. one page placard- two sides, with two ghost written books, and a Nobel Peace Prize for “Global Anti-Privacy Act” a documentary ” Why no one should have a right to expect privacy subtitled How I finished bringing down the Last Great Republic”. Hooray, Long Live the Banana Corporate Republic; ChikitAmerika. Hey, would whistle blower protection apply to a defecting SCOTUS judge? Can one Judge institute impeachment against the domestic enemies of the Constitution even if it’s his coworkers ? Does it take a majority? Leo I’m apolitical and admire your respect for the Court. I have the same respect Jesus had for the Court in his case. Someone order 8 washbowls and maybe 9! Best wishes Leo, eventually Truth Reigns. Your work is historically notable! I HOPE THAT PEOPLE IN WASHINGTON WILL READ THIS AND PLEASE FOR THE LOVE OF GOD AND COUNTRY FIX THIS MESS. ITS NOT TO LATE TO DO THE RIGHT THING. WHY MUST WE CONTINUE TO TRAVEL DOWN THIS ROAD OF DISASTER. CAN’T YOU SEE WHAT YOU PEOPLE ARE DOING TO THIS ONCE GREAT COUNTRY? PLEASE STOP BEING IGNORANT TO THE PLEAS OF THE PEOPLE AND STOP THINKING OF YOURSELVES AND YOUR NEXT HIGHER OFFICE FOR JUST A BREIF MOMENT AND FIX THIS! Nice brief…but another typo on the last page, I think: you maintained the original date - Nov 25, 2008 from the old brief. or was that done on purpose? All in all, good brief. Question:/Point I feel you developed your NBC thesis argument better on this blog than in the original Cort application ( I presume due to the benefit of more time and ongoing reflection/research) - the Cort application while strong… just doesn’t seem as comprehensive as your arguments on the blog. i think it would be very beneficial..if at this stage given all your research you present a new document detailing your ENTIRE argument from beginning to end - in a very comprehensive fashion. This will be good for history, posterity and perhaps SCOTUS clerks, SCOTUS Justices who read this blog may see this even if it can’t be submitted to the court. it will also serve to educate the lay public. Kudos! We await Dec 12, 2008! It seems some folks like telling you this case is going no place…and need to tell you as to why it will not work. We get it that some people see no good reason for good men to do any thing. I really do think it will it will happen ! I do not mean by that that Obama will not become the next POTUS but that he will qualify and someone will make sure that he does. That is what most of us on here want. An education and the Laws and DUTIES of our elected officials to be carried out. I know this is all that I want to happen. If that is done and Obama takes office I am ok with it. It seems to me you bend over backward to try an explain your point of view. I have a formal education of the 8th grade level and I can get it. You wanted the SCOTUS to know your thoughts backed up by your facts about the Election process in your state in regards to this year’s POTUS election. You have trust and faith the SCOTUS in their wisdom, based on what they know and the office they hold to do the right and honorable thing. In so doing your goal was to be fair and get your filing before the SCOTUS before the election. You have done that, your way. We will see what becomes of it. No one should doubt your faith in your desire to be fair to all and trust in your fellow man. We appreciate your reply, be well and prosper. When did “soon, probably 1818/1819″ (on page 4 of Gentleman Boss, Reeves) become “certainly” emigrated to Canada in 1818/1819 in the supplemental brief? [Ed. There is no "probably" in the following book's same assertion: Chester Alan Arthur: The Life of a Gilded Age Politician and President By Gregory J. Dehler Published by Nova Publishers, 2007 ISBN 1600210791. "Born in Northern Ireland 1796, he had immigrated to Canada in 1818 or 1819..."
Greg Dehler is a skilled historian/researcher. The Arthurs lived near Ballymena, County Antrim, in Ulster, where Chester Alan Arthur's father, William, was born in 1796. Family tra­dition credits him with a degree from the University of Belfast. Shortly after coming of age, William Arthur emigrated to Canada, settled for a time at Stanstead, Quebec, as a teacher, and then took a school in Dunham, where he met and married Malvina Stone in 1821. "Gentleman Boss" states that William and Malvina were married in 1821 also on page 4. Footnote 3 of "Gentleman Boss" places the year from the Arthur family Bible. Ungar's book gives the same year, 1821. Working back from 1821, Ungar's book establishes that "William first settled for a time at Stanstead, Quebec, as a teacher" before going to Dunham. He "settled for a time" and he took a job "as a teacher." After that time, "he took a school in Dunham". In 1821 he married Malvina Stone. "Gentleman Boss" tells us they eloped. Ungar also tells us William "met" Malvina Stone in Dunham. So, they had to meet, fall in love and finally get married. Since we know he married Malvina in 1821 and working back on the above facts, "1818 or 1819" has been established to a reasonable degree of certainty. "At about eighteen, he graduated from Belfast College and soon, probably in 1818 or 1819, he emigrated to Quebec." "Gentleman Boss” establishes, on page 4, that Chester Arthur’s father William was born in Ireland, 1796, and emigrated to Canada in 1818 or 1819." What information do you have about the years between 1814/1815 (graduation, 18 years old, emigration according to Chester) and 1818/1819 (”probably” emigration according to Reeves, page 4)? Do you have information that places him in Ireland -or elsewhere- in the intervening years? Did William ever visit the uncle in Cincinnati before taking his first jobs -like the one teaching position mentioned without date in Dunham- in the Vermont/Quebec area? I can’t find conclusive evidence for the date of emigration on those pages of the book you reference. Where was Chester between 1814 and 1818? [Ed. Chester was in another dimension between 1814-1818. It has been established that Chester Arthur gave misleading information about his parents' lives while he was campaigning. The historical record shows this. His Brooklyn eagle interviews conveniently skip over William Arthur's time in Canada and give the impression William came directly from Ireland to settle in Vermont at the age of eighteen. Sorry, that last line should be: Where was William between 1814 and 1818? Mr. Donofrio, I appreciate your hard work and level-headed approach to the whole issue. Like the others, I find your research into Chester Arthur to be intriguing that indeed poses some striking parallels to Obama’s situation. If only the media could emulate the intellectual honesty you have shown, perhaps more people would be aware of the constitutional implications. I’m praying and hoping that the justices will give Cort’s lawsuit a fair shake and bring it up for a public hearing so that the Americans can be assured that the next president won’t have a cloud hanging over him. It seems so ludicrous that Obama would spend upwards of $800,000 to deny us the transparency of his administration as he promised rather than shelling out a few bucks to have his birth certification released and have the matter put to rest, assuming he has nothing to hide. I read the supplemental brief. I thought it was a fine job, very well written, concise and to the point. I stay hopeful the JUSTICES will do the right thing. Arthur’s hidden secrets are fascinating. I would not want to go to my death with so many heavy lies on my soul. How do politicians live with themselves I wonder. As the first commentor said…you are quite the sleuth, Leo!!! Sherlock truly would be impressed. You are a man of many trades. It isn’t every Supreme Court that has the opportunity to clarify a fundamental part of the U.S.Constitution, particularly one that clarifies the eligibility requirements for the President and Vice President. By defining “natural born citizen” this court would make history. I suspect that their desires to clarify the law, much less egos as lawyers, will cause this court to deal with this issue. Let’s hope they do it soon! The disappearing papers for Arthur reminds me of all the stories that were onlne last night in the various news papers about Obama’s scheduled meeting with the Illinois Governor Blagojivich on Dec 5th to discuss who would be best to fill his seat in the Senate since Obama will be stepping down soon. That was just a few days ago. Now with the Governor being arrested for trying to sell the seat to the highest bidder, Obama has said on TV his has not met or discussed his replacement with the Governor. Now the articles I have booked marked last night are gone. The net is being scrubbed. What did Obama know about all this seat selling wheeling and dealing by the Governor and when did he know? And what if any does the government have on tape between those two that has not been disclosed in the initial complaint. I waited with baited breath to learn what SCOTUS decides on Friday. Keep up the good work. Leo, You should take a look at this. With that being said and ruled on, does that mean “Natural Born Citizen” is now defined by the Supreme Court? SCOTUS needs to hear and rule on this case — the Framers are rolling in their graves. This is the appropriate time, the appropriate case, and absolutely the appropriate situation. I pray the Justices heed this call, and proudly perform their duty to uphold our Constitution — it would be a great day in America — to do otherwise would leave our country in a shroud of darkness, with nothing left but a memory and profound sadness. Leo, Cort, again, thank you for all you are doing for us, for our Country, for our Constitution. If nothing else, we should be pushing the illegal dealings with Blegojovich and Obama on top of the Citizenship and BC issues, Justice will be served! Many people have questioned why the Founding Fathers did not define the phrase “natural born citizen” in the Constitution. The answer is simply that the meaning was commonly understood and there was no reason to define the term. in Book I, Chapter XIX, part 212, it says: “The natives, or natural-born citizens, are those born in the country, of parents who are citizens.” Here is the definition the Founding Fathers did not deem necessary to supply since it was already understood. Supreme Court Justice Scalia’s views on how to interpret the US Constitution. Shall we allow Obama to do an Arthur? Who is that one person …. …. … who finally compelled Barack Obama to show legally acceptable proof and evidence that he is a natural born citizen as he alleged in his application form for his candidacy for the position of President of the United States? Or do you simply take Obama at his word? Is this what the rule of law is about? You can be part of American history. View and answers and questions there.. The truth of the matter is, that SCOTUS does not need to define or clarify the concept of Natural Born Citizen, as it is already well defined in such works as de Vattel’s Law of Nations. SCOTUS rather needs to uphold the definition and apply it to deciding cases wherein the right of citizens to vote is being underminded. Howeve, here’s the rub: there is no strict constitutional right for the general citizenry to vote for the US President: there is a right for the Electors to vote, but only in those states where they are bound by a state law to vote for the candidate who received the most popular votes. In those states there would be the problem brought forward by you, Leo, in your case, wherein the one with the right to vote cannot vote for an eligible candidate. In such a case an elector needs to bring suit against the SOS and State on the basis that their admission of ineligible candidates to the ballot let to the Elector’s virtual disenfranciscement. Then you’ll have a case that is strictly constitutional. Only then. § 211. What is our country. I love a good mystery and this one has it all, especially that it is history repeating itself. Arthur got away with it but I pray that Obama won’t. I have always been amazed how little people know about American History. How can we understand the present if we don’t understand the past? I bet Leo, you and Cort were just sweating as you were looking for the past on Chester Arthur in the Library. Thank you again and again for all your work. All involved with you and your work are true patriots. Chester reportedly burned most of his papers as soon as he left office. Amazingly, some did make it to the archives. Which says to me, that either the papers that are still around are benign, or they had some significant meaning that they were saved from the pyre….Glad this document survived! think so? must be some law-nerd thing. Wait till you start following the money. You can see it even with chester, and the greenbacks/silver/standard oil trust, his treasury appointments (folger i think), etc. though it was going on long before that. But, I don’t want to distract you from whats directly relevant to your arguments. Maybe when you’re done you can look into that rabbit hole. Fantastic work though, good job. Anyways, have you seen Scalia’s Charlie Rose interview? It’s on google video. I enjoyed it and the bit of insight it gives. Though I didn’t like the picture of how politicized even that court has become. “”Ed. I am looking into this. Damn. The readers of this blog are freakin good researchers.”"
There are thousands of us out here trying to uncover every stone we can find and spread the truth. Thank you Leo for everything you are doing. Here is the site and reference for the book Ed was talking about. FREE online. 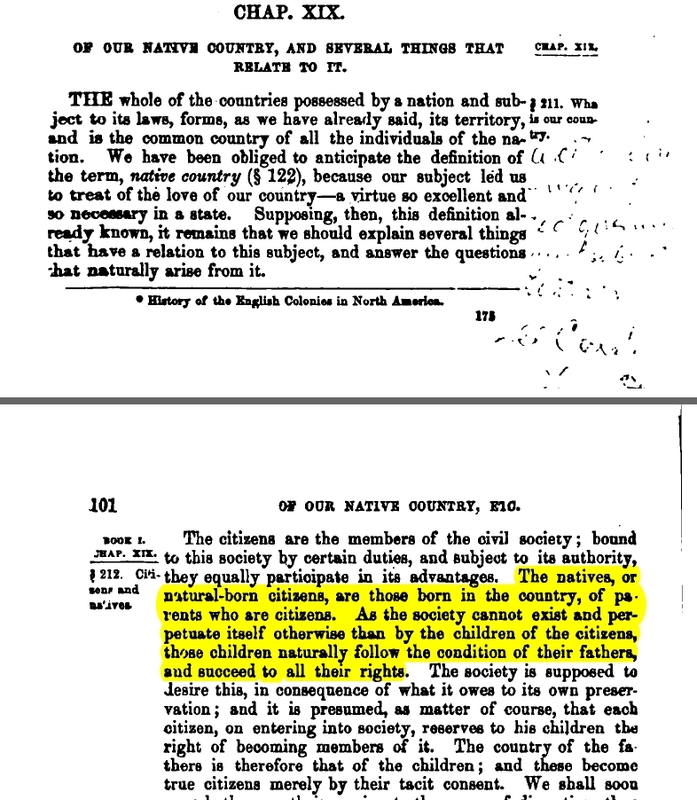 ………..The natives, or natural-born citizens, are those born in the country, of parents who are citizens…………. I have been reading this site for about a week now. Honestly, I believe that God has called Leo Donofrio into the public to raise valid questions about the person who was elected POTUS back in November. But I believe that the problem with the newly elected POTUS is much deeper than people even understand. You see, the so-called Founding Fathers were into an alternative form of religion around the time the Constitution was written. I would call this religion, “Christi-Masonism.” With this quasi-religion, the Founding Fathers attempted to cement a constitutional republic based on freedom of choice with only an acknowledgement of God’s will as somewhat of an afterthought. America answers to God, not the Supreme Court, not to Congress. You should all step back from being so emotional about this whole matter and let God work. The Supreme Court doesn’t want to touch this issue, because they don’t want to be blamed for un-choosing the recently elected POTUS. What Americans don’t understand is that the country has been on the wrong track for a very long time, and that economics will be the downfall of the country, not politics. I happen to live in Franklin County, Vermont where the name Chester Arthur causes people to speak with a tone of reverence. The Chester A Arthur historical site says it was his birthplace, but most people know it wasn’t. I’m thinking about writing a letter to the editor for our weekly newspaper with the not a natural born citizen info. They wouldn’t print my “Barack Obama isn’t a natural born citizen” letter to the editor, saying it had nothing to do with Franklin County. It will be fun to see what the editor will say about Chester A Arthur. Anyway, Leo, I can’t say thank you enough for your work and commitment. I know this, though, God blesses those who work to expose darkness with light. Here’s a little more information on who the clerks are. I’ve seen some other studies from the 1990’s that suggest the Justices try to hire some politically sympatico clerks as part of their mix. I’ve seen some articles about the more topical or controversial issues which were expected to be heard during the ‘08-’09, and tried to put myself into the position of a law clerk who might “push” for a case like these two to be heard. Since each Justice has 3 or 4 clerks, it’s hard to know how the petitions get dispersed among them. This paper written by Michael D. Ramsey provides background showing that the framers of the constitution were well steeped in the Law of Nations. I highlighted in blue some relevant portions (nothing else was changed from the original word document). Not sure how much it helps. I see you see the need to review all my comments before you post them to your blog. That means I am untrustworthy and adding to your burden of work when I post here which is not something I want to do as I want your effort and attention on the case at hand. Sorry to have bothered you; I will stay away. Still, I hold you in high regards and in my thoughts and prayers and I hope Cort’s case is successful! The Arthur stuff is riviting! I can’t believe the media isn’t picking up on it. It is a story all by itself! Could you please tell us what’s happening with Berg’s case? Is it dead? Why or why not if you know. Do his filings have any bearing on yours? I couldn’t tell anything from his web site. Given Mr. Berg’s history, I accept what he has to say with the greatest degree of caution, but I confess I’m still curious. You are working alone on this case and have received some substantial help from some of the readers who have commented on the blog. You have also had some typos in your brief(s). Perhaps you should contact readers who have helped you and whose opinions you respect with a request to at least proofread your briefs before you file them. Relying on your own proofreading is usually less effective because you see what you want to see, especially when you are tired. You could even break up the briefs and only let each individual see part of your arguments. I know that it is hard to know whom to trust, but there seem to be some very committed citizens who would like to help you and give your case the best chance to succeed. and at first I thought he was a crack pot, however, I went back into the website and spent more time in it because I was naggingly disturbed by the articles, and then I became convinced that he may be explaining the Truth. I came to the conclusion that these articles present an explosive twist to the constitution that no one has ever heard of (Regarding Natural Born Citizen and regarding the constition as a whole) (in one article he claims that he has a discovery about the constitution that no one has ever found before) and I would sleep well if the professor was totally wrong. There are approximately 5 pages of Long articles and I’ve read them all. He hops & Skips through the 5 pages where you will find more articles about Natural born citizen mixed in with articles of current happenings, and he references all points of all the articles with the constitution. Granted that Only a Lawyer and Only those familiar with constituonal Law will truly be able to GRASP all he is Explaining, to either validate or dismiss this Professor, but if he is correct, we are in trouble, because the implications of what he is saying are HUGH. I was able to summarize what he was saying, in my mind, without truly understanding everything but I understood enough to be shaking in my boots. teachings/findings/discovery are somehow able to be used in legal court, It would be total chaos in that it makes our constitution be a total mockery and I am sure that would be pleasing to many in America at this time. over worked, (understantement) but if you ever have time to skim over these 5 pages, either it will provide you a good laugh or an education that you don’t even want to hear. Leo, what you have done for the Nation is astounding and umprecedented. Even if SCOTUS does not hear Cort’s case, your efforts and his have raised the issue for the Electoral College to consider on Dec. 15th and for the Congress to consider on Jan. 6th. But I believe that we who are American citizens must recognize that words have meaning apart from and previous to any law, or any decision of the court. Some believe laywera are trained not to think so; but as rational men we must admit this, otherwise the US Constitution has no objective meaning, and SCOTUS can never err. If Obama is allowed to assume the Presidency, every concientious patriot, in my opinion must regard him as a usurper, because there is no way that anyone today can change the historical signifcation of the words “natural born citizen” to include Obama as such, and therefore objectively, apart from what SCOTUS or any other human court decides, he can never be eligible for the office, without an Amendment to the US Constitution. Leo, I appreciate your efforts to see our Constitution followed. Unfortunately you aren’t going about it the right way. The remedy you seek is to enjoin the secretary of state from putting McCain and Obama on the ballots. Or perhaps you sought to have her remove their names which I do not believe is technically correct. Either way I’ll give you the benefit of the doubt since it isn’t relevant to my point. You cannot seek injunctive relief to stay something that has already happened. The issue is moot - it is impossible to give you the relief you are seeking. This is well settled in the law. “Mootness” is a fundamental basis for the Supreme Court lacking subject matter jurisdiction over cases. “§ 212. Citizens and natives. Yes, Leo - Ed caught a good one. NOTE: Vattel says “parentS who are citizenS” — “born”, “parentS” and “citizenS”. – SO, what does it mean when the father is a foreign citizen, and the mother is too young to transfer US Citizenship … what does that mean in the context of the Constitutional meaning of “Natural Born Citizen”? Leo, my previous post should have said section 212 in Chapter 19–would you please correct this? Thanks! not apply to all children born in Panama, but only to those born to U.S.
sections, a child born in Panama on or after February 26, 1904, to a U.S.
Do I also understand, that you are of the opinion, and informed the same as Pastor Baldwin? If so, then I believe 7 FAM 1131.9 demands your further scrutiny, and any official briefs that convey this ignorance be amended in a timely manner. The questions of “dual nationalities,” is best answered via 7 FAM 1100; 7 FAM 1111.4 Dual or Multiple Nationality. Here I definitely agree, that a “dual allegiance” (at birth) poses a serious Constitutional question under Article II, Section I. A person proven to be born with “split allegiances,” is most problematic for the office of POTUS; especially for the CinC of US Armed Forces. I don’t believe that our founders ever intended to even go this direction; especially in light of the “Naturalization Act of 1795.” The ambiguity of the matter should make this academic. However, I fear that post the 14th amendment, and subsequent FAMs via the State Dept., has thrown further “wrenches” into the matrix. In terms of the “dual citizen,” this is going to be a tough one, even in the higher courts. John Boy, way to go. This is what we have been looking for. Leo, You probably found this already. OF NATIONS CONSIDERED IN THEMSELVES. OF NATIONS OR SOVEREIGN STATES. Vagrants are people who have no settlement. Consequently, those born of vagrant parents have no country, since a man’s country is the place where, at the time of his birth, his parents had their settlement (§ 122), or it is the state of which his father was then a member, which comes to the same point; for, to settle for ever in a nation, is to become a member of it, at least as a perpetual inhabitant, if not with all the privileges of a citizen. We may, however, consider the country of a vagrant to be that of his child, while that vagrant is considered as not having absolutely renounced his natural or original settlement. and, from this reading, I think that McCain would have qualified to be POYUS… am still transcribing. VERY RICH. direct. Was it the 9 washbowls reference or Reference to the Christian take? why not mine. Know UR busy but curious? All lands inhabited by a Nation and subject to its laws form, as we have said, its domain, and are the common country of its citizens. We have been obliged to anticipate the definition of the term one’s country, (§ 122) in treating of the love of country, that noble virtue so necessary in a State. Presuming, therefore, that definition to be known, we shall proceed to explain certain matters connected with the subject and to clear up the difficulties it presents. The members of a civil society are its citizens. Bound to that society by certain duties and subject to its authority, they share equally in the advantages it offers. Its natives are those who are born in the country of parents who are citizens. As the society can not maintain and perpetuate itself except by the children of its citizens, these children naturally take on the status of their fathers and enter upon all the latter’s rights. The society is presumed to desire this as the necessary means of its self-preservation, and it is justly to be inferred that each citizen, upon entering into the society, reserves to his children the right to be members of it. The country of a father is therefore that of his children, and they become true citizens by their mere tacit consent. We shall see presently whether, when arrived at the age of reason, they may renounce their right and the duty they owe to the society in which they are born. I repeat that in order to belong to a country one must be born there of a father who is a citizen; for if one is born of foreign parents, that land will only be the place of one’s birth, and not one’s country. Residents, as distinguished from citizens, are aliens who are permitted to take up a permanent abode in the country. Being bound to the society by reason of their dwelling in it, they are subject to its laws so long as they remain there, and being protected by it, they must defend it, although they do not enjoy all the rights of citizens. Permanent residents are those who have been given the right of perpetual residence. They are a sort of citizens of a less privileged character, and are subject to the society without enjoying all its advantages. Their children succeed to their status; for the right of perpetual residence given them by the State passes to their children. A Nation, or the sovereign who represents it, may confer citizenship upon an alien and admit him into the body politic. This act is called naturalization. There are some States in which the sovereign can not grant to an alien all the rights of citizens; for example, that of holding public office; so that he has only authority to grant an imperfect naturalization, his power being limited by the fundamental law. In other States, as in England and Poland, the sovereign can not naturalize aliens without the concurrence of the representative assembly. Finally, there are others, such as England, in which the mere fact of birth in the country naturalizes the children of an alien. It is asked whether the children born of citizens who are in a foreign country are citizens. The question has been settled by law in several countries, and such provisions must be followed. Arguing from the natural law, children follow the status of their parents and enter upon all their rights (§ 212); place of birth does not affect the rule and can not of itself afford any reason for depriving a child of a right given by nature; I say of itself, for the civil law may, with a special object in view, provide otherwise. I am supposing that the father has not entirely given up his country with the intention of taking up his abode elsewhere. If he has his domicile in a foreign country he has become a member of another State, at least in the character of a perpetual resident, and his children will be members of the same State. As for children born at sea, if born in those parts which are subject to the jurisdiction of their Nation, they are born in the State; if born on the high seas, there is no reason for making any distinction between them and children born within the State, for it is not place of birth which by the Law of Nature confers rights, but parentage. If children born on a vessel belonging to the Nation they may be considered as born within its territory; for it is natural to regard the vessels of a Nation as portions of its territory, especially when they are upon the high seas, since the State retains jurisdiction over them; and since by common custom this jurisdiction over the vessel is retained even when the vessel is in waters subject to the jurisdiction of another State, all children born upon the vessels of a Nation are considered as born within its territory. For the same reason children born on a foreign vessel are considered as born in a foreign country, unless they are actually born in a port of the Nation; for a port is in a peculiar way part of the national territory, and the mother, because of her being for the moment on a foreign vessel, is not out of the country. I am supposing that she and her husband have not left the country to live elsewhere. For the same reasons, children of citizens, when born outside of the country, in the armies of the State or in the house of its minister at a foreign court, are considered as born in the country; for when a citizen is abroad with his family, in the service of the State, and is subject to its authority and jurisdiction, he can not be considered as having left his country. The above transcription is from the 1916 publiication. that James Garfield was a very strongly protective president; he imposed high tariffs and was very close to his SOS Blaine on that issue. LaRouche maintains that Garfield’s assassin was cultivated by British agents to assassinate Garfield. What you will see is that when Chester Arthur took office, he lowered the tariffs, replaced most of the cabinet and became more appeasement oriented than Garfield. So, it might even be further extrapolated that the British knew about Arthur and were able to blackmail him to give them the concessions they need for their empire? Just as an aside — have you noticed how closely the Foreign Affairs Manual on citizenship follows the nearly the same topics as de Vattel Book 1, Chapter 19! Not all the topics are identical, but they are close enough in order to perhaps indicate that one was used when the other was written. Switzerland became a Republic on August 1, 1201. So, by the time de Vattel wrote, it had more than 550 years of history under its belt. It celebrated 800 years earlier in this decade. Researching a little further, during the early Garfield presidency, blaine had significant dealings with Peru. A little more from the above quote:”As Garfield clung to life, Gen. Hurlbut arrived in Peru, clashed sharply with British diplomats, and recognized the regime of Garcia Calderon, who had been chosen by the underground Peruvian nationalist leadership. The U.S.S. Alaska landed a brother of President Calderon in Mollendo, with money and instructions for Peruvian resistance fighters. Britain’s Chilean proxies arrested President Calderon and took him away to Santiago. On Nov. 29, 1881, Secretary Blaine, still in office, called for a peace conference of all republics in the Western Hemisphere, to convene in Washington one year later.” that conference never took place, as, wen chester Artur assumed the Presidency, he replaced Secretary of State Blaine. So, if there was an impact, then I guess it would be the history of and legacy of Peru and Latin America whose history was completely altered by the assassination foa US President . Any comments on this article? In response to the link to the ‘Scalia Charlie Rose’ video posted by ‘nobody,’ I felt pretty good about SCOTUS until minute 19:58 of the video. At that point, they are discussing Bush v. Gore, and Scalia, while not concerned about the SC’s interpretation of the constitutionality of halting the FL recount (they determined it was unconstitutional to allow it to continue, and their judgment was seemingly unaffected by public opinion), he and apparently the Court were concerned about the ‘world view’ of the U.S., our election process, and delaying the “lengthy” transition to a new President. He more or less admits that these aforementioned factors affected the expeditiousness with which they issued the decision in the case. If he/SCOTUS thought the situation for the country was embarrassing then, what must they think of this current situation and how the world, not to mention the citizens of this country, will respond to the SCOTUS returning this election to a constitutional condition in light of ineligible candidates? Shall we be the “…laughing stock…” again? I say, “Yes” if in the end it is in defense of the Constitution and the rule of law in the United States of America. Based on Scalia’s comments on Bush v. Gore in this interview, I would expect SCOTUS to act as expeditiously as possible in the case of Wrotnowski v. Bysiewicz. I sincerely hope they are doing so, but I don’t get that ‘vibe’ with no stay being issued on Friday and Scalia’s comments on delaying a Presidential transition. A stay at this point will really derail the transition train. Surely, at least four Justices are immune to such considerations when making a judgment…and I’m not saying Scalia isn’t. In fact, I believe he is immune. In the interview he even suggests that he’s immune to himself, and he later states “I have never joined an opinion that I did not think was correct, in its…not only in it outcome but in its essential reasoning.” I just didn’t like his commentary and concern for appearances. For me, it cast a sliver of doubt on the SC where I believed there was none. To bolster that doubt, I inferred from his later comments that Justice Ginsburg is an appeaser more than I would have imagined. Yikes!